For the past week, I was privileged to participate in an innovative program designed to bring paleontology into the k-12 classroom. The organizers are Greg Wilson, a vertebrate paleontologist at the University of Washington, and his graduate student, Lauren Berg. The DIG school, as they call it, brings teachers from Montana out into Greg’s field site north of Jordan, Montana, and introduces them to Greg’s research, the geology of the area, and paleontological field techniques. I was along to assist in developing curricula for the teachers. We had a blast. 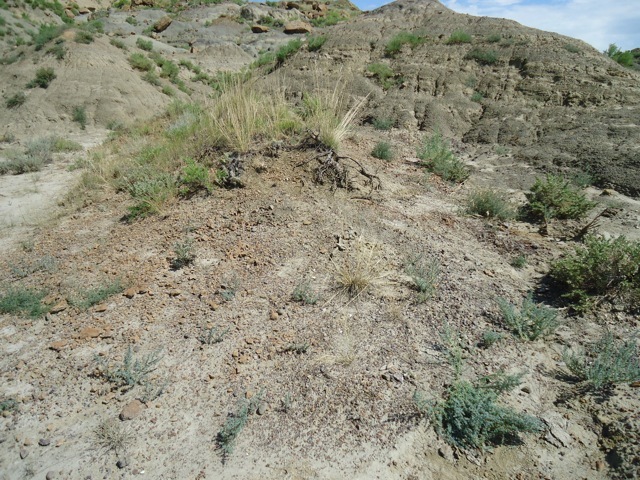 We spent four days out in the field, in the badlands of the Hell Creek and Tullock Formations. Both units represent fluvial deposits with channels and overbank deposits. The main difference, and the key one for distinguishing the two, is the presence of lignites in the Tullock, due to perched water in swamps and ponds. Deposition of the Hell Creek occurred during about the final four million years of the Creteceous. The Tullock, which sits conformably atop it, was deposited during the first couple million years of the Paleocene. A 2-cm-thick bed of ash separates the two layers. 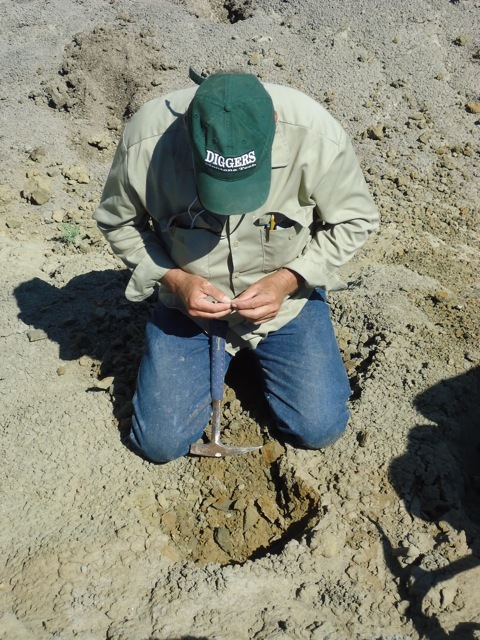 Most of the fossils that Greg studies are small mammals, turtles, and amphibians, which requires tightly focused examination of surface deposits. 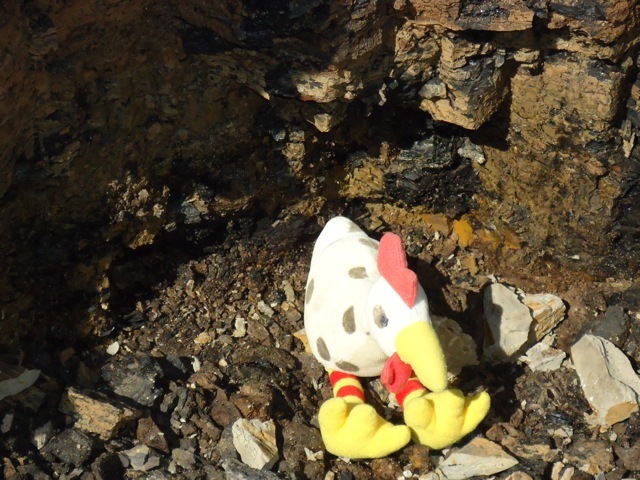 In most cases, the fossils blend in quite well with the popcorn texture of eroding clays and silts. We donned knee pads and cheaters (magnifying lenses like the ones worn by jewelers), and poked and probed on our hands and knees with awls. Each time we found a fossil we put it in a film canister that contained a field label with site name and number, date, and collector. As we gained in knowledge, we continued to search for fossils, visit additional sites, and try new field techniques. We figured it how to distinguish clay from silt by tasting it. 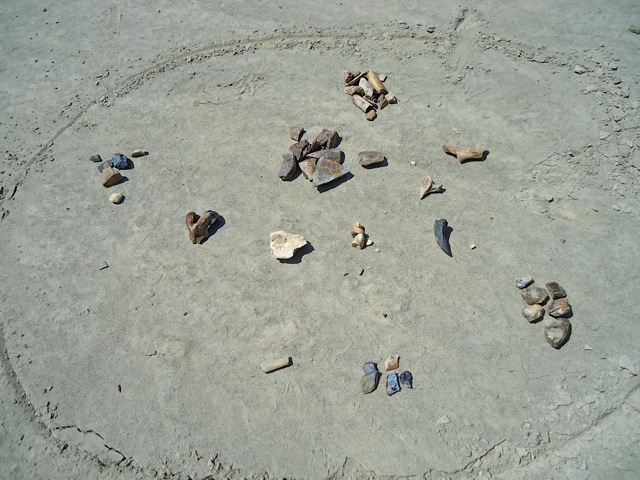 We talked about ways to incorporate paleontology in the classroom. We learned that paleontologists have odd names for their sites, such as “Bubble Tea,” “Chef Marie,” and “Crack Dirt.” We found theropod teeth, turtle scutes, mammal teeth, gar scales, various dinosaur bones, vertebrae, and triceratops teeth. 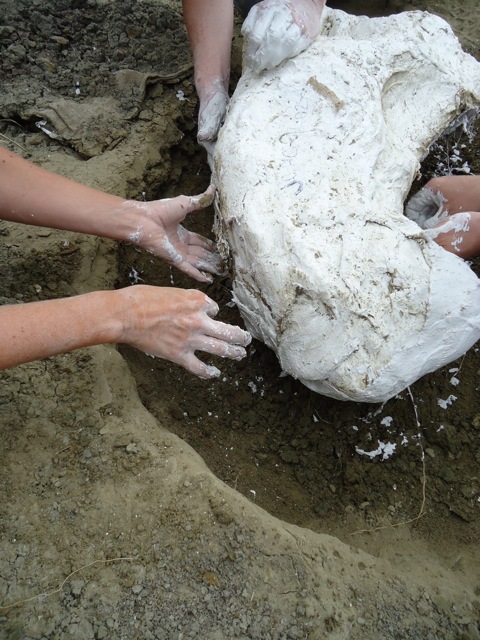 We also participated in unearthing and jacketing part of the jaw of a Triceratops. One of the highlights was also seeing the contact between the Hell Creek and the Tullock and the legendary K-T boundary. Greg took us to a spot where we could see and touch the iridium-rich, ash layer deposited by the bolide. In the future, Greg, Lauren, and I plan to continue to work with the teachers. We want to assemble a traveling box that contains specimens, background material, field tools, and lesson plans. We also hope to make this box and the lessons plans applicable to a wider geographic area than the wonderful sediments around Jordan. Judging from the enthusiasm of the teachers we worked with, I think there will be many who want such information. I certainly hope so.